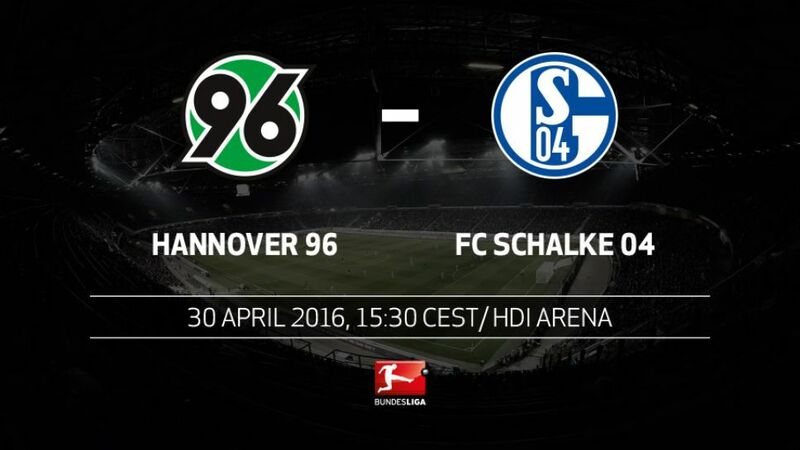 FC Schalke 04 are hoping to give their European qualification aspirations a timely boost when they travel to the HDI Arena to take on already-relegated Hannover 96 on Saturday afternoon (kick-off 15:30CEST/13:30GMT). Hannover battled back bravely from two goals down to seal a 2-2 draw against ten-man FC Ingolstadt 04 last Saturday, but it was not enough to stop them returning to the second tier of German football for the first time in 14 years. Now playing for pride, interim coach Daniel Stendel has yet to taste defeat since replacing Thomas Schaaf at the start of the month, and despite the visitors boasting more than twice as many points as the 96ers, Schalke's recent form offers some hope. The Royal Blues contrived to throw away a two-goal lead against Bayer 04 Leverkusen last Saturday, with a six-minute capitulation seeing Die Werkself seal a 3-2 win. A seventh-placed finish brings with it UEFA Europa League football, and although Andre Breitenreiter's men have a five-point cushion on 1. FC Köln in eighth, the Gelsenkirchen club need to put together some wins - and soon - to stay among the European places. Schalke are winless in four Bundesliga games, in which time they have only taken a single point (the 2-2 Revierderby draw with Borussia Dortmund on Matchday 29).With Eintracht Frankfurt and SV Werder Bremen still to play each other, one of those two clubs is guaranteed to reach 32 points, a tally beyond bottom-side Hannover's reach.This is Hannover's fifth Bundesliga relegation, although the last time before this season they went down 1989. The 96ers took 13 years before climbing back into Germany's top flight in 2002.Schalke have won 15 of their 27 games against Hannover since Die Roten were last promoted. No team has fared worse against the Royal Blues in the time since.Hannover are yet to lose under interim coach Stendel, with the 42-year-old overseeing one win and two draws so far.Breitenreiter has won an average of 1.45 points per game with Schalke. Predecessor Roberto Di Matteo managed 1.48.This is the first time in 17 years that Schalke has had a negative goal-difference after 31 matchdays (43 goals for, 46 goals against). An attacking midfielder with Hannover in the early 90s, Schalke coach Breitenreiter has enjoyed a perfect record against his former club as a coach, with three wins from three games.Hannover have not played out a goalless draw for a current Bundesliga-record 63 games.Hannover have lost 12 of the last 15 games at their HDI Arena. One more defeat would draw them level with SpVgg Greuther Fürth's unwanted record of 13 home defeats in a single season.